Anything Worth Doing in 2017 is Worth Doing With WOW Customer Service. WOW is such a short, simple word, but it really encompasses a lot of things especially in delivering innovative Customer Service. 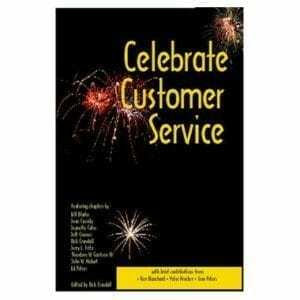 To provide WOW Customer Service you must differentiate yourself. This means doing something a little unconventional and innovative. Today it’s about awesome ideas that engage your Customers. You must do something that’s above and beyond what’s expected. And whatever you do must have an emotional impact on the receiver. Remind yourself are not an average company. Your service is not average. You don’t want your people to be average. You expect every employee to deliver WOW. Whether internally- with co-workers, or externally-with your customers and partners, delivering WOW results in word-of-mouth conversations that create more WOW. My philosophy is to WOW with service and experience. 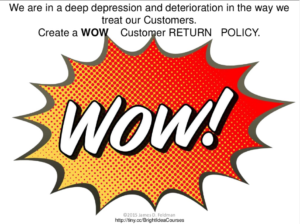 WOW is a big part of what differentiates Zappos, Nordstrom, Apple Store Customer Service from most other companies. Strong relationships allow them to accomplish much more than we would be able to otherwise. Do you WOW your Customers? Employees? Suppliers? Stakeholders? WOW=Who Offers What. As your company grows, communication becomes more and more important because everyone needs to understand how his/her team connects to the big picture of what we’re trying to accomplish. Communication is always one of the weakest spots in any organization, no matter how good the communication is. Make it a commitment in your organization that you want everyone to always try to go the extra mile in encouraging thorough, complete, and effective communication. Commit to WOW and you will positively impact your bottom line. What will WOW mean to you in 2017?